Ensemble Caprice – Sunday, April 28 at 3:00 pm at the Saranac Methodist Church on Route 3 in Saranac, NY – One of the pre-eminent baroque music ensembles performing worldwide today, Montreal-based Ensemble Caprice is Matthias Maute and Sophie Larivière on recorders, Susie Napper on cello; and Ziya Tabassian on percussion. They will perform a fascinating and beautiful program “iLove baroque!” featuring music of the 17th and 18th centuries: works by Purcell, Handel, Bach, Schmelzer, Falconieri, and Vivaldi. Requested donation at the door $15; special rate for students and seniors. 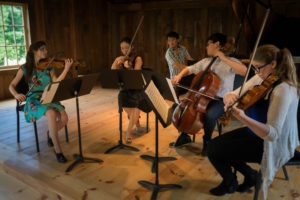 Meadowmount School of Music – Off-Campus Concert – Thursday, July 25 at 7:00 pm at the Saranac Methodist Church on Route 3 in Saranac – A group of advanced international students (ages late-teens to early twenties) studying at the prestigious string camp in the Adirondacks will perform duos, trios, and quartets which they have been rehearsing and receiving coaching from the renowned faculty. Our annual free concert! 25th ANNIVERSARY GALA – Saturday, August 10 from 3:00 pm until……. an outdoor event at Weatherwatch Farm in Saranac. Festivities galore under a big tent! Live music by the Inora Brass Quintet — Americana and Jazz. Authentic Deep South Barbecue by Joe Lewis. A “Wine Pull” featuring vintage wines from the legendary cellar of Kellum Smith. Lots of cool stuff to bid on in a silent auction and a live auction with the incomparable Steve Martin. And then when the sun goes down, party and dance into the night with Curley Taylor & Zydeco Trouble, all the way from Louisinana. Save the date! Patti McCarty and Friends: Arturo Delmoni, violin; Patricia McCarty, viola; and Julia Lichten and David Geber, cellos – Sunday, November 3 at 3:00 pm – Instead of two violins, this is a string quartet with two cellos! Meadowmount School of Music “Off-Campus Concert” – Thursday, July 25 at 7:00 pm at the Saranac Methodist Church on Route 3 in Saranac, NY – Annual Free Concert! Hill and Hollow Music is honored once again to be host for an off-campus concert by advanced students of the renowned Meadowmount School of Music. Founded in 1944 by the legendary Russian violinist and pedagogue Ivan Galamian, the school became – and continues to be today – a pre-eminent summer program for young musicians training for a professional career in music. Alumni of Meadowmount have won every major competition worldwide, and are among the very best of international soloists and chamber musicians, concertmasters and principal players of the world’s leading orchestras, and the distinguished artist-teachers in every major university and conservatory. March 9-10, 2019 – Ray Vega Latin Jazz Sextet – The atmosphere sizzled with two spicy shows on Saturday evening and Sunday afternoon by Ray Vega’s first-rate ensemble featuring some of Vermont’s finest jazz musicians: Brian McCarthy on alto saxophone, Mike Hartigan on piano, Giovanni Rovetto on bass, Caleb Bronz on drums, Scott Dean on congas and percussion, and Vega himself on trumpet, flugelhorn, and percussion. The program was combination of standards and originals by Vega and members of the band. One standout moment, particularly poignant, was their remembrance of Rick Davies, a beloved friend, colleague, and member of the greater jazz community who passed two years ago, followed by a performance of one of Rick’s tunes. And yes, indeed, there was dancing in the aisles! February 2-3, 2019 – Nicolas Babineau and Alexis Chartrand – Two marvelous shows by French-Canadian traditional music duo, comprising two fiddles, guitar, and foot-percussion, performing an extravagant array of reels and traditional fiddle music they collected from Francophone communities in the far reaches of eastern Québec and Canada’s Maritime provinces, including Chicoutimi, Gaspésie, Cape-Breton, and Newfoundland, as well as some of their own original music. The duo was joined by the remarkable Québecois step-dancer Mélissandre Tremblay-Bourassa. All three artists put a distinctive contemporary spin on their traditional roots music and dance – really exciting stuff! October 28, 2018 – New York Polyphony – The program “Faith and Reason” featured two very different and significant works: the 16th-century Mass for Four Voices by Thomas Tallis (1505-1585), sung in Latin; and the contemporary secular mass, Missa Charles Darwin, composed by Gregory Brown (b. 1974) on texts from Darwin’s On the Origin of Species and The Descent of Man, and sung in English; plus a few other contemporary works that were composed especially for the ensemble. New York Polyphony’s concert was all that we hoped for, and more! Presenting them in Redford’s Church of the Assumption was spot-on. The darling old stone church with its cathedral-like resonance allowed the voices to ring out and float in the air. The vocal blend was miraculous, while each of the singularly beautiful four voices remained distinctive and strong. It is clear why New York Polyphony enjoys a reputation as one of the finest vocal chamber ensembles in the world. August 19, 2018 – Emerald Trio – The New York City-based musicians were with us for an intense week of work and fun. They broke in a new pianist, James Sheppard, who was also commissioned to compose a new work for the trio. The work was written on-site and rehearsed in close collaboration with the players (an ideal situation), and subsequently given its premiere at the concert August 19, where the audience greeted it warmly. Indeed, the entire program was fascinating and engaging, with a beautiful suite by Mel (née Mélanie) Bonis (1858-1937), a little known contemporary of Ravel, and works by T.O. Sterrett (b. 1953), Howard Cass (b. 1989), and Alessandro Annunziata (b. 1968), demonstrating their commitment to uncovering lost gems from the past, as well as contemporary chamber music and building the repertoire for their ensemble’s instrumentation of flute, violin/viola, and piano. July 26, 2018 – Meadowmount School of Music Off-Campus Concert – We were privileged to be host for an off-campus concert by advanced students of the renowned Meadowmount School of Music. The program began with Weilu Zhang playing two movements of the Sonata for Solo Violin in A minor, BWV 1003 by J.S. Bach. Then followed the exquisite Ravel Trio in A Minor with Liam Kaplan, piano; Nanao Yamada, violin; and Jeremy Tai, cello. After intermission Jeremy Tai performed a movement Kodaly’s wild and virtuosic Sonata for Solo Cello, Op. 8. The glorious culmination was Schumann’s Quartet for Piano and Strings, Op. 47, with Matthew Harikian, piano; Weilu Zhang; violin; Aaron Rosengaus, viola; and Luiz Venturelli, cello. Founded in 1944 by the legendary Russian violinist and pedagogue Ivan Galamian, the school soon became – and continues to be today – a pre-eminent summer program for young musicians training for a professional career in music. Alumni of Meadowmount have won every major competition worldwide, and are among the very best of international soloists and chamber musicians, concertmasters and principal players of the world’s leading orchestras, and the distinguished artist-teachers in every major university and conservatory. June 23, 2018 – Jonathan Aceto, MIDI violin, with the McLean Mix – His solo electric violin program offered SAMPLER: Everything Goes When the Whistle Blows, a riveting work by Salvatore Martirano about the 1985 terrorist hijacking of the cruise ship Achille Lauro and Desert Voices by Priscilla McLean with a slideshow of photos of the Sonoran Desert, where many of the sounds on the background tape were recorded. Following the performance was a screening of Rainforest Images II, an evocative music-video by Barton and Priscilla McLean based on their adventures in Malaysia and Borneo. Additionally, in a side room, the McLeans created an audience-interactive installation that drew from world music, sounds of nature, and intriguing experimental techniques, and invited folks to experience and participate in the creation of music and sound. Great fun! May 6, 2018 – Lise de la Salle, piano – The extraordinary French pianist Lise de la Salle offered “Bach Unlimited,” her current signature solo recital program, conceived as a profound and shining tribute to the timeless genius of J.S. Bach. The concert began with Bach’s Italian Concerto and moved through three centuries of composers inspired by Bach: Liszt (Fantasy & Fugue on the Theme B-A-C-H), Bach/Busoni (Chaconne), and pithy shorter works of Roussel, Poulenc, Kempf and Enhco. Lise’s outstanding performance demonstrated not only her powerful virtuosity, but also her extreme delicacy and touching devotion to this music. It is clear why Lise is one of the most celebrated artists of her generation – she recently turned 30! April 6-8, 2018 – Tim Collins USA Jazz Group – Vibes virtuoso Tim Collins teamed up again with Robinson Morse on double bass and Gabe Jarrett on drums, inviting guitarist/vocalist Davy Mooney as featured guest artist. The quartet converged in Saranac for a run of three shows at the Fire Hall, which was transformed into a funky little jazz club such as might be found in Alphabet City in the East Village. The guys did a mellow mix of standards and originals by Tim Collins and Davy Mooney, with periodic bursts of energy and fireworks – overall a perfect balance of cool and hot. Goldilocks would say “just right.” All shows were well attended; standing room only at both Saturday and Sunday shows. Sunday, March 4, 2018 – Rhythm Future Quartet – Keeping the spirit of Gypsy jazz alive and expanding in today’s musical universe, the virtuoso acoustic jazz foursome, named for a Django Reinhardt tune, offers up a newly minted sound, influenced by the classic Hot Club of France, yet wholly contemporary. Led by violinist Jason Anick and guitarist Olli Soikkeli, the quartet performs dynamic and lyrical arrangements of both Gypsy jazz standards and original compositions that draw upon diverse international rhythms and musical idioms. With Max O’Rourke on second guitar and Greg Loughman on bass, Rhythm Future is dedicated to expanding the boundaries of a vital musical genre. Saturday, February 24, 2018 – Lavrova-Primakov Piano Duo – Two extraordinary Russian pianists Natalia Lavrova and Vassily Primakov formed as a duo in 2010 after graduating from Juilliard. They come to Saranac with some regularity to work and perform, and we always look forward to their lively visits. The Duo tried out an exciting new program to a full house at Weatherwatch Farm: Danse macabre, Op. 40 of Saint-Saëns, Night on Bald Mountain of Modest Musorgsky, Andante and Allegro Brillant, Op. 92 of Felix Mendelsson, and Blue Danube Fantasy of Greg Anderson. It was a dazzling performance and the audience roared with delight! Saturday and Sunday, November 18-19, 2017 – Journey West – Seven virtuoso multi-instrumental artists of diverse nationalities and ethnic backgrounds performed world music on violins, saxophone, clarinet, flute, mandolin, guitar, oud, bass, accordion, and all manner of percussion. The fascinating musical travelogue chronicles the migration of melody and changing instrumentation from the Middle East, through Eastern and Western Europe, and finally arriving in the United States. Two excellent concerts were for the benefit of Plattsburgh Cares, an organization that provides humanitarian aid for asylum seekers and refugees traveling through our community on their way to Canada. Sunday, October 8, 2017 – Soovin Kim and Gloria Chien, violin-piano duo – One of the most dynamic couples on the classical scene today did not fail to thrill and astound. Featured works were Robert Schumann’s Sonata No. 1 for Violin and Piano in A minor, op. 105 ; Charles Ives’s Sonata for Violin and Piano, No. 2 ; and Richard Strauss’s Sonata for Violin and Piano in E-flat Major, op. 18. The audience could not go home without hearing some favorites by one of the greatest all-time masters of the violin, Fritz Kreisler. No surprise, best attendance ever! Friday, September 15, 2017 – Olympus Piano Trio – violinist Regi Papa, cellist Ben Capps, and pianist Konstantine Valianatos had a retreat to prepare a rather hefty program for upcoming concerts and competitions – trios of Brahms (No. 1 in B Major, op. 8), Ravel (A Minor), and Greek-Canadian contemporary composer Christos Hatzis (Odd World) – which they tried out in the living room at Weatherwatch Farm. We had a great turnout because folks remembered how superb the trio was last year – and again several audience members pronounced it the best concert they have ever heard! There is indeed something extra-special about experiencing live music in such close proximity to the artists. Sunday, July 9, 2017 – Passepartout Duo – Nicoletta Favari, piano, and Christopher Salvito, vibraphone, were in residence to rehearse a new commission by Molly Joyce and to record videos of it and other works in their contemporary repertoire, which were subsequently posted on YouTube. At the conclusion of their residency they gave a live audio-visual performance with additional percussion, some electronics, and lights, besides piano and vibraphone. Works included the premiere of Molly Joyce’s Less is More, works by George Aperghis and Andy Akiho, and an animated film short by Mayke Nas with music composed by Salvito. Our audience found the challenging program quite a stretch, but Favari and Salvito won them over with their competence, precision, passion, enthusiasm, humor, and charisma. Sunday, April 9, 2017 – the Davydov-Fanning Duo – Cellist Dieuwke Davydov and pianist Diana Fanning, both Affiliate Artists at Middlebury College, performed their 40th Anniversary Concert before taking it on tour in Europe. The meaty and moving program featured Beethoven Cello Sonata No. 2 in G Minor, op. 5, Hindemith Fantasiestück, Brahms Cello Sonata No. 1 in E Minor, op. 38 and Camille Saint-Saëns Allegro Appassionato, op. 43; plus Chopin “Berceuse” and two Debussy études for solo piano. Sunday, January 22, 2017 – Lilac 94 – The contemporary harp duo performed a program devoted entirely to the music of Carlos Salzedo, very likely the greatest harpist of the 20th century and possibly the greatest-ever composer for the harp. Before performing Salzedo’s ground-breaking (and challenging) work Pentacle, they gave an illuminating lecture-demonstration of the extended techniques he developed and applied copiously therein. Other lighter works Lilac 94 performed were “Chanson dans la nuit” and “Tango” and “Rumba” from Salzedo’s Suite of Eight Dances. An audience of 90+ responded enthusiastically to the Q & A and, of course, the music! Sunday, November 20, 2016 – The Delmoni-McCarty-Thomas String Trio performed mature Mozart (Divertimento in E-flat Major, K563), early Beethoven (Trio in C minor, Op. 9, No. 3), and youthful Ernst von Dohnanyi (Serenade in C Major, Op. 10). The players’ warm friendship plus their deep respect and love for the music animated and illuminated the exquisite program of monumental masterpieces. Sunday, October 16, 2016 – Gloria Chien, piano – A superb solo recital featured Debussy’s Suite Bergamasque, several of Mendelssohn’s Songs Without Words, a Chopin Nocturne and Barcarolle, Liszt’s Venezia e Napoli, and a Scriabin Nocturne for left hand. About 120 attended the feast of favorites from Romantic and Impressionist periods. Sunday, August 21, 2016 – Olympus Piano Trio – violinist Regi Papa, cellist Ben Capps, and pianist Konstantine Valianatos performed trios of Rachmaninoff (No. 1 in G Minor “Élégiaque), Brahms (No. 2 in C major, op. 87), and Tchaikovsky (A Minor, op. 50). A rich, substantial program richly delivered. The Tchaikovsky moved one to tears, Several audience members pronounced it the best concert they have ever heard! Saturday, June 25, 2016 – Balkanville – Balkan music by Montreal ensemble featuring Richard Simas, clarinet; Sean McCutcheon, accordion and winds; Cathy Inouye, tuba; Becky Lazarovic, tapan, and special guest Max Fass, accordion. House concert at Weatherwatch Farm with an informal concert on the deck followed by dancing on the lawn. Al fresco drinks and dinner, too, on a perfect summer evening overlooking the Adirondacks. 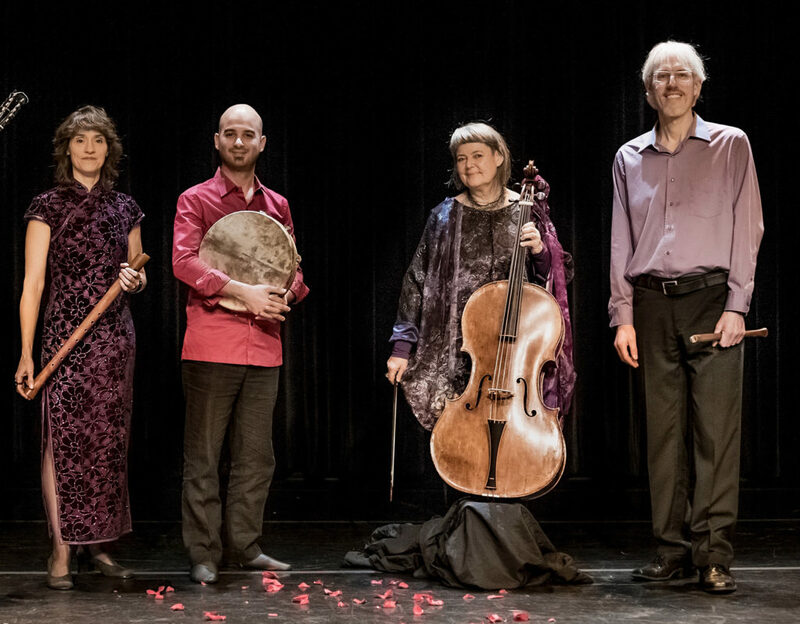 April 3, 2016 – Rebel Ensemble for Baroque Music – Jörg-Michael Schwarz and Karen Marie Marmer, violins; John Moran, cello; Donsok Shin, harpsichord performed Barocco: Musical Treasures of the 17th and 18th Centuries. Our audience flipped over the energy and style these artists brought to the music, not to mention sheer virtuosity. We won the lottery on this one! February 12-14, 2016 – Tim Collins USA Jazz Quartet – The North Country’s home-grown luminary Tim Collins on vibes traveled from his now-home in Germany for three exciting shows at the Saranac Fire Hall “Jazz Club.” Special guest star was New York City jazz piano phenom Ayako Shirasaki and rhythm by Vermont jazz notables John Rivers on bass and Gabe Jarrett on drums. This was the real deal. Wish we could hear great jazz like this around here more often! November 22, 2015 – Concert of Piano Quartets – Superb violist and Adirondack resident Patricia McCarty was joined by three renowned colleagues: Jung Lin, piano; Arturo Delmoni, violin; and Ronald Thomas, cello. Their thrilling and deeply satisfying program included Mozart’s Piano Quartet in E flat, K. 493; Faure’s Piano Quartet No. 2 in G minor, Op. 45; and Brahms’s Piano Quartet in A major, Op. 26. The audience responded to a unique musical happening with multiple standing ovations! October 25, 2015 – Johannes String Quartet – The acclaimed ensemble opened with Homunculus, an exciting 15-minute work written expressly for them by the world-renowned Finnish composer-conductor Esa Pekka Salonen. Also featured was Mozart’s String Quartet No. 15 in D Minor, K. 421 and Brahms’s String Quartet No. 3 in B-flat Major, op. 67. Playing at the highest level and the house was packed – a love-fest, for sure! August 23, 2015 – Emerald Trio – New York City-based Karen Bogardus, flutes; Orlando Wells, violin and viola; and Matt Castle, piano and composer performed a concert of new works written especially for them by hot-on-the-scene NYC composers Carolyn Steinberg, Matt Castle, Joseph Pehrson, Gene Pritsker, Dan Cooper, Milica Paranosic, and Davide Zannoni. Our annual free concert. Fascinating, challenging, and well received – kudos to intrepid artists and audience alike! July 19, 2015 – Gretchen Koehler and Daniel Kelly Duo – by New York State Hall of Fame fiddler Gretchen Kelly partnered by NYC-based jazz pianist Daniel Kelly offered a beautiful and diverse selection of tunes, both traditional and original, in a unique and fascinating performance of many styles of fiddling and improvisation. 13-year-old Syl step-danced into the hearts of all! June 28, 2015 – Red Hedgehog Trio – Boston musicians Marina Krickler, horn; Marjorie Gere, violin; and Daniel Sedgwick, piano performed works for solo keyboard (Bach) and violin-piano duo (Brahms), as well as for horn-violin-piano trio (Harbison). They premiered their new commission “10 x 10” – a huge hit! May 3, 2015 – Ricochet Duo – Jane Boxall on marimba and Rose Chancler on piano performed “DANCES,” a delightful array of short dance-inspired works, including ragtime, tango, and more. March 22, 2015 – Duo FAE – Violinist Charlene Kluegel and pianist Katherine Petersen performed a traditional recital featuring three sonatas by Beethoven, Faure, and Ives. Nourishment for the soul. February 8, 2015 – The Guidonian Hand – Four virtuoso trombones juxtaposed art music of the past (Bach, Haydn, Mozart, Debussy) with contemporary works of living composers (Galen Brown, Jeremy Howard Beck, Conrad Winslow). Totally wonderful! November 16, 2014 – Patricia McCarty and Cary Lewis – Two superb artists at the top of their game offered a deeply satisfying and memorable viola-piano duo recital featuring works Bach, Beethoven, Brahms, and the contemporary American composer David Avshalomov. October 12, 2014 – Russian Duo – Balalaika artist Oleg Kruglyakov and pianist Terry Boyarsky guided a rapt audience on a fascinating journey across the span of Russian culture with folk music, lyrical romances, rhythmic dances, classical music favorites, gypsy melodies, and popular songs. August 24, 2014 – The Allant Trio astounded a full house at the Methodist Church with elegant, energetic virtuosity. This was our now-annual free concert and about 140 attended. They gave a perfectly paced performance of Hadyn’s Trio No. 39 in G Major (Gypsy), Canadian composer Kelly-Marie Murphy’s Give Me Phoenix Wings to Fly, and Mendelssohn’s Piano Trio No. 1 in D Minor, Op. 49. July 11 and 13, 2014 – The Rocky Hill Ramblers gave two delightful shows at the Saranac Fire Hall. The three-member band of fiddle, guitar, bass, with sophisticated vocal harmonies performed 60s and 70s folk, rock, jazz, and blues, along with some ancient traditional tunes plus originals. Sweet memories and smiles! June 22, 2014 – The Lavrova-Primakov Piano Duo performed music for one piano, two-, four-, and six-hands on our nine-foot Steinway at the Methodist Church. Approximately half of the program featured works by South African composer Braam van Eeden, including two solo sonatas and the premiere of Allegory, dedicated to Hill and Hollow Music. Van Eeden was present to receive a standing ovation after each (three SOs!). Also performed were Twelve Pieces, op.66, of Anton Arensky and Six Morceaux, op. 11, of Sergei Rachmaninoff. As an encore, van Eeden joined Lavrova and Primakov at the keyboard to play Rachmaninoff’s charming Valse for six hands!